In december I attended TEDx Brussels, a local spin-off of the hugely succesful TED events. It turned out to be very worthwile and inspirational. The verdict: whole lotta hits, and a couple of misses. One of these misses was a non-functioning wireless connection, leaving all these hip TEDsters bewildered, not knowing what to do with their hands, phones and Ipads. It was a priceless sight. Another miss, Miss Lynne McTaggart, manifested herself late in the coffee-fueled afternoon, when she took the stage to talk about her Intention Experiment. She stated that the universe is connected by a vast quantum energy field and can be influenced by thought, enabling us to change our lives (and the world, while we’re at it). Now, I’m quite a film buff and the movies taught me that a little suspension of disbelief goes a long way, so I smiled, sat back and decided to enjoy the show. Lynne McTaggart started to describe some mind-over-matter experiments that she organized, including an effort to improve the water quality of Lake Biwa, Japan by concentrating on the lake together with a large group of people. She claimed she had scientifitic evidence that it really worked. My tester genes started itching. Was she serious? The evidence will be next, I’m sure. Err… nope. She started talking about her healing powers instead. I was too confused to be amused. Where was the evidence? My comfy chair became less comfy all of a sudden. She called out for people with illnesses. A woman with a nasty bacterial infection stumbled forward. “This can’t be happening”, I thought. I started looking around to check the reaction of others, but Lynne beat me to it and asked us to hold hands with our neighbors and concentrate on this poor woman’s illness while new-age music started oozing from the speakers. That is where I drew the line. No holding of sweaty hands with strangers on a spacy soundtrack. I’m a tester, dammit. A skeptic. The music stopped and Lynne McTaggart quickly rushed off the stage, leaving everyone bewildered. What did just happen? No idea whether the audience beat the infection. She didn’t even bother to check. No way to verify her claims then and there. If only she would have focused on healing the TEDx wireless. That would have won everyone over. James Randi is a tester! On the way back home, I was still pondering what I just witnessed. This is exactly the kind of crookery that magician and professional skeptic James Randi has been battling against for years. Randi gained recognition in 1972 when he publicly challenged the claims of spoon bender extraordinaire Uri Geller. Later on, in 1996, Randi founded the JREF (James Randi Educational Foundation) with the mission of educating the general public on the dangers of accepting unproven claims, and to support research into paranormal claims in controlled scientific experimental conditions. They are also awarding critical thinking scholarships to college students nationwide. How cool is that? I’ve always admired James Randi for his unrelenting skepticism and his ongoing battle against paranormal fakery. For me, he is a testing role-model, the original tester. Like Randi, I’d like to see myself as a professional (software) skeptic. This reminded me of something James Bach wrote a long time ago: testers should have a wary eye and a skeptical mind. James also stated that skepticism isn’t the rejection of belief, but rather the rejection of certainty. And that’s what testers should do: it’s natural that our clients want to become more confident in the system under test, but we should make clear to them that at no point we can promise absolute certainty. In fact, we should be the ones still doubting when every one else isn’t seeing any problems. 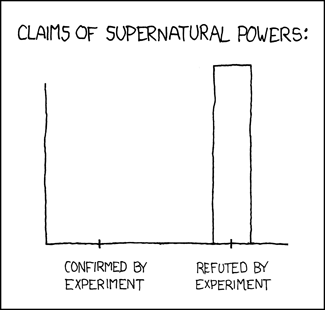 The JREF offers a one million dollar prize to anyone who can demonstrate a supernatural or paranormal ability under agreed-upon scientific testing criteria. They originally put out the challenge in 1968 for 100 dollar, and the prize money has been rising ever since. Randi has put out very stringent entry criteria for testing, as it should be: claims that cannot be tested experimentally are not eligible for the challenge. Needless to say that no one ever collected any prize money. Can’t we learn from that? I think we can. Let us not test the untestable, and make sure that we don’t start testing when we can’t create minimal conditions of testibility. When the results of our tests won’t tell us something valuable, why bother? We’re not dealing with telekinesis or bent spoons here, but with faulty software brimming with risks and emergent behaviors. We aren’t surrounded by ectoplasm, ghosts or faith healers, but by people that think we can “test quality into a product” and that it is possible to “test everything”. Sounds like testers shouldn’t only be software skeptics, but software myth busters as well. Software myth busters? I can live with that. But that’s a different blog post altogether.